The United States’ Federal Open Market Committee issued a statement on Wednesday, June 13, 2018, raising its benchmark rate by 25 bps and setting the target range for the federal funds rate to 1.75% to 2%, while maintaining an accommodative stance of monetary policy, in order to support strong labor market conditions and to achieve its long term objective of a 2% inflation rate. The rate hike has been implemented in the backdrop of a sharp rise in the employment rate alongside a rising inflationary trend in the US economy. Consumer inflation (both the headline and the core) mayas well be expected to run well above the Fed’s target rate of 2%. The Federal Reserve has projected a median federal funds rate of 3.1% by the end of 2019, implying two rate hikes in 2018 and two more in 2019, upgrading both its growth and inflation projections amidst tightening labor market conditions. 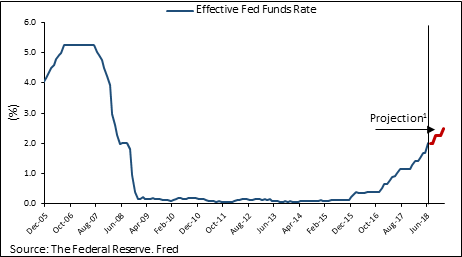 However, the actual path of the federal funds rate will depend on the incoming economic data. Such rate hikes and/or hawkish messaging by the Federal Reserve affects not only the US economy, but also shapes the macroeconomic outlook and exerts a certain degree of influence on monetary policies in other emerging economies. For instance, this hike by the Fed seems to have influenced, at least partially, the repo rate hike by 25 basis points that was implemented by the Reserve Bank of India’s (RBI) Monetary Policy Committee, last month , effectively implying a reversal of the easy monetary policy regime that was being followed, in the Indian economy, for the past three years. Usually, emerging economies such as India tend to have higher inflation and higher interest rates than those in developed countries such as the US and many of the (primarily Western) European nations. As a result, financial institutions, particularly foreign institutional investors (FIIs) would want to borrow money in the US at low interest rates in dollar terms and then invest that money in government bonds of emerging countries such as India, in local currency terms – to earn a higher rate of interest. When the US raises its domestic interest rates, the difference between interest rates of the two countries decreases, thus making India less attractive for the currency carry trade. As a result, some of the money may be expected to move out of the Indian markets and flow back to the US, therefore decreasing the value of India’s currency against the US dollar.In this light, it can be realized that had the RBI kept its rate unchanged while the Fed hiked them further, the spread between US borrowing costs and earned interests in India would have narrowed further. That could lead to greater capital outflows, and by extension– further weakening of the rupee. As far as the Indian equity markets are concerned – consecutive increases in Fed Fund rates, as expected, have largely been priced in and absorbed well by Indian equities. In fact, the markets initially reacted positively as the increase in rates were in line with consensus estimates. However, stocks in major emerging market economies have faced sell-offs due to the strengthening dollar and uncertainties perpetrated by the trade war between the US, China, European Union, and other major nations. In India, the debt and equity markets have witnessed outflows of over 40,000 crore rupees during the April-May period. Across the emerging economies, bond yields have risen due to growing dollar shortage in the global market and on prospects of higher interest rates in advanced economies. Having said that, India is better equipped to ride the impact of higher US interest rates due to its stronger economic growth and healthy foreign exchange reserves of more than $400 billion. The adverse effect on INR although, will hurt India’s forex reserves and imports. India being one of the largest crude oil importers of the world, a weaker rupee vis-à-vis a dollarresults in more expensive imports of crude oil that may put cost-driven inflationary push across the whole economy and especially in those sectors that are highly sensitive to crude oil price movements. India generally runs a trade deficit, and such rate hikes by the Fed are more likely to widen the trade deficit. India’s exports on the other hand, notably IT and IT-enabled services – will benefit to some extent from a stronger dollar w.r.t. the rupee. Companies with large import bills may suffer, however, the same benefit may not fully accrue to exporters due to strong competition in the export market.The only visible silver lining in this situation could be the recent decision by the OPEC countries to keep pumping and restoring crude supply to early 2017 levels, thereby reducing the cost of crude oil – that may partially offset India’s woes due to a weakening currency. In sum, the Fed’s benchmark interest rate hike in line with expectations doesn’t impact the Indian equity markets directly, however FII capital outflows that result in weakening of the Indian Rupee vis-à-vis the dollar and a widening trade deficit at the backdrop of potential spikes in crude oil price, unless reigned in – may be worrisome for India in the mid to long term. INTUERISPEAK: SHOULD POOR COUNTRIES CURB THEIR CONSULTANCY SPENDS? Copyright 2018 - www.intueriglobal.com - All rights reserved.